Online collaboration tools are cloud-based software that allow workers, including in-office, remote and distributed team members, to share ideas, communicate and work together on documents and projects. We looked at the top-rated tools and selected the seven best for small businesses based on price, ease of use and available third-party software integrations. G Suite [Best overall] for business document sharing, task management, email, calendar, chat and video. Slack Businesses that want team communication, customization, feedback and the ability to search messages. Trello Project teams due to Kanban-style tasks and checklists, links, emoticons, and app integrations. 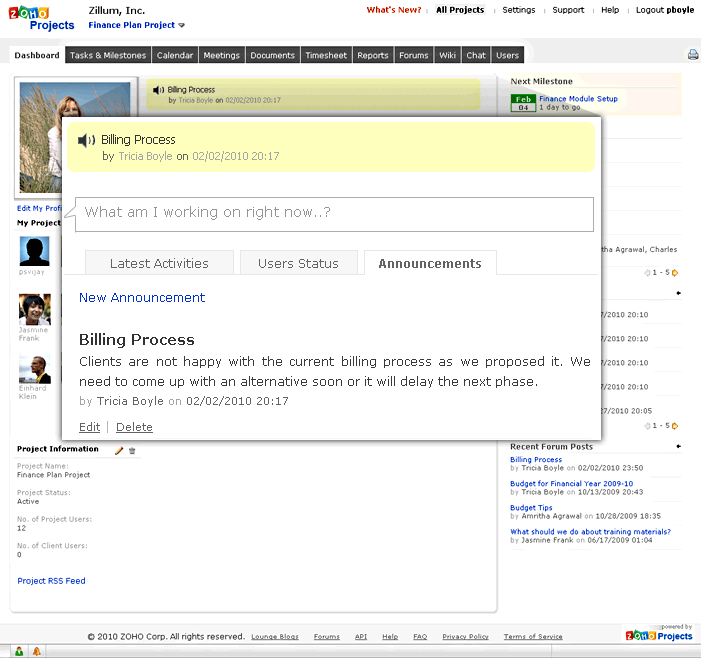 Zoho Projects Business that bill clients and need to track employee time spent on projects. Engagedly Companies that want to manage worker performance, goals, meetings and projects with peer feedback. Basecamp Businesses that need document sharing, communication and a robust project management suite. Monday Businesses that do large client projects that require customer feedback, with security. To identify the best online collaboration tools, we looked at the kind of features a small business with a distributed workforce might need—like communication tools, project tracking, and document sharing. In addition to being low-cost and easy to use, we wanted to make sure the software we recommend were top-rated and that team members would like using them. Due to many of its tools being free (like Gmail and Google Docs), and because it offers so many native integrations, we recommend G Suite as best overall online collaboration software. G Suite, short for Google Suite, is the best overall collaboration tool for any business because of its integrated document sharing, tasks, email, calendar, chat and video meetings. It replaces the need for networked software such as MS Office Suite, and can be set up without IT support. Most of the tools are available free to anyone with an internet connection by signing up for a Gmail email account. However, many businesses choose to upgrade to paid plans that range in price from $5 to $25/user per month. While that’s a bit more than other tools, this provides access to personalized company email addresses, additional data storage, audit reports and advanced security features. It also saves you from having to download, install, maintain and configure expensive software, like MS office. And it provides all those features in a cloud-based tool, making integration and sharing easy. G Suite ranges in price from $5 to $25/user per month, although anyone can get a free plan. All paid plans provide email, video, calendars, messaging and documents. However, the $10/user per month package is best for small business due to unlimited data storage if you have five or more employees. In addition, G Suite offers a free 14-day trial so you can get a sense of what a paid package provides as compared to what you can get in a free Gmail account. G Suite provides all of the primary online collaboration features a small business would need. You and your employees will have email accounts, can share calendars, and you can add on tools (called extensions) to do everything from record your video screen to check your spelling. Gmail has a clean, easy-to-use interface. You can also create, manage and share documents of all types. In addition, shared documents stored online can be viewed, commented on and edited by anyone to whom you give permission. And if you forget to save your edits, no worries! G Suite autosaves everything. Here are some of the standout features that make G Suite the best overall software for online collaboration. Anyone can get a Gmail account. With a business plan, you can also obtain customized Gmail accounts for your entire team using your own domain. You can even create shared accounts at no additional cost, if, for example, you want all billing questions sent to one shared email address like billing@abccompany.com. Google’s calendar allows you to schedule a meeting with anyone inside or outside your organization, as long as you have their email address. In addition, you can add links to video conference tools and notes on your meeting topic. You can also share calendars for company holidays or team member birthdays, as examples. And team members can share calendars with each other, making it simple to book a workgroup meeting, whether in person, or virtual. 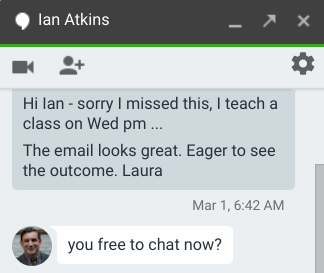 Hangouts provides text, voice and video chat. Google Hangouts is another communication tool G Suite offers for online collaboration. You can text chat, or schedule a voice or video call through the G Suite system. That prevents you from having to buy, install or train your employees on other video conference tools. These tools reside in the same window as your Gmail account, so you can quickly follow up with a face-to-face video call if you get an email and need more information. 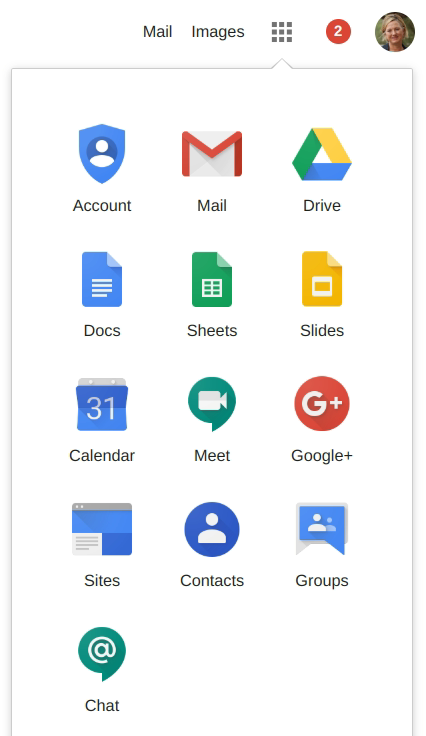 Google Docs gives you access to individual and shared document storage, and includes the most common form of business documents and templates—including documents, spreadsheets, slides, and forms, along with many pre-made forms and templates. Having pre-made templates for invoices, time sheets and expense reports can save your team oodles of time. You can call or email Google support and talk to a live person 24/7. They also have an online help center for users to search for and find answers on their own. In fact, if you have a question about any aspect of G Suite, you can just “Google” it. Unlike collaboration tools focused more on project management, like Monday and Zoho Projects, G Suite doesn’t have reports such as Gantt charts and project costing. However, it does offer a tasks function. G Suite is designed to keep all team members on the same page, but not necessarily to manage complex projects. Further, it allows instant messaging, chat and groups, but they’re less searchable than in Slack, by comparison. Third-party review sites give G Suite a solid four- to five-star ratings. We use G Suite ourselves, and find that its best features are email, team calendar/scheduling and document creation and storage. While you can get a free consumer Gmail account with access to many of the G Suite features, businesses may find it best to have the administrative controls and document storage that come with the Basic plan. Slack is a free collaboration software tool designed for online communication with real-time messaging and feedback. It’s best for organizations with employees who work on common projects and teams—even if they work in different locations. It has a robust search engine to allow users to find the information or project they need, and channels can be customized to any type of work, teams or projects. 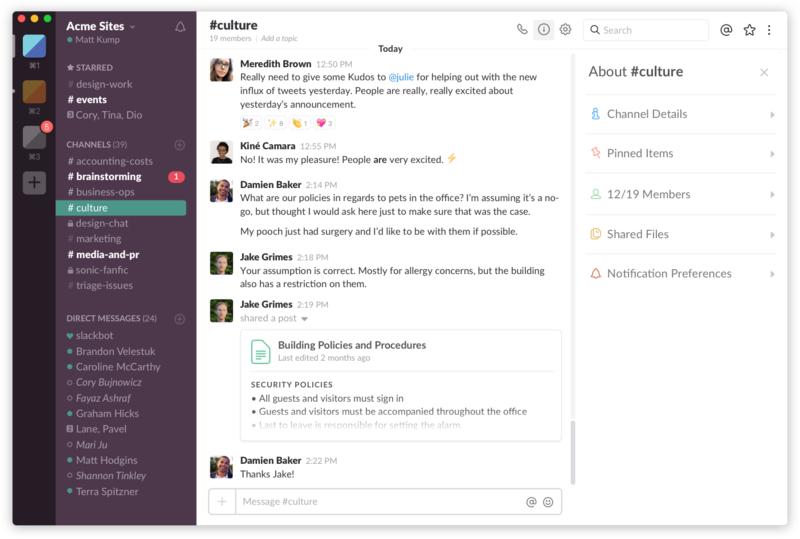 Slack provides online collaboration through Channels. In addition, it integrates with over 1,000 third-party applications, such as Concur (travel), Weather Hippie (forecasts) and Twitter. Even in the free package, you can choose up to ten apps to integrate. Using Slack, workers can make free voice and video calls, but unlike Google Hangouts, those video calls are limited to 40 minutes. With a paid plan starting at $6.67/user per month, your employees can also conduct group meetings and share their software application screens online. If you only need a single workspace with messages, one-on-one video calls and a limited number of integrated applications, Slack is free. That’s a great way to start with Slack. If you find that you want group calls, guest accounts, shared channels, single sign-on and other features like the ability to export all messages, you can opt for a paid plan that ranges in price from $8 to $15/active user per month when paid monthly. Here’s the breakdown. *Discounts available with annual billing. For a plan that guarantees 99.99 percent uptime, provides single sign on (SSO) and 24/7 support, you’ll want to upgrade to the Plus plan. It will cost only $12.50/user per month if you pay annually. But the best part is that you can start with a free plan now, and decide later whether upgrading makes sense. Slack stands for searchable log of all conversation and knowledge. That’s a big lift! The way it does that is by allowing your teams to create channels, invite team members, share information and search for content online. Team members can comment with GIFs and emoticons to provide feedback on members’ contributions. They can also share files, images, and links—keeping all team communications in one searchable platform. Channels can be set up any way you like. They can be organized by function, location, project, or shared interest, as examples. For instance, a restaurant may want to have a channel for menu ideas, whereas a manufacturer may want to have a channel for standard operating procedures. We use Slack channels at Fit Small Business to allow our distributed team members to share insights, and we also have a Slack channel for peer praise, which we call #shoutouts. Slack allows users to search messages so that your employees need not remember exactly where that link was to your company handbook or customer contact form. With the free package, only the last 10,000 messages are searchable. To search all messages (which may be important as your company grows), you’ll need to upgrade to a paid plan. However, one way to keep key documentation visible is to “pin” it within the channel, so it’s always at the top. 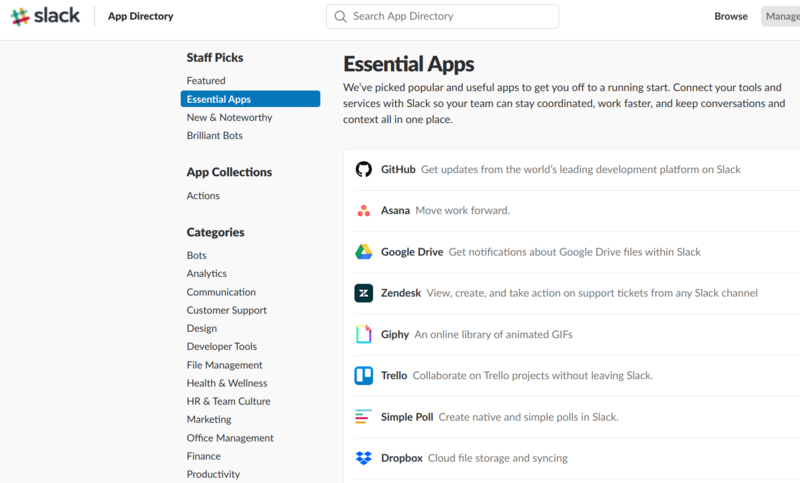 Slack integrates with third-party applications as diverse as Zoom (video conferencing), Google Calendar (scheduling), Asana (project management) and Dropbox (file transfer and storage). It is simple for workers using any of these tools to start communicating in Slack. Slack provides over 1,000 app integrations. The range of integrations includes bots, polls, security software and apps to improve team culture. In fact, we’ve recently invited BirthdayBot to our teams’ Slack channel to keep track of teammates’ birthdays as our company grows. With so much competition in the online voice and video space, it’s nice to know you don’t need to buy a separate tool. Slack’s one-on-one meetings can be set up free for everything from job interviews to employee feedback and manager updates. Once you begin hosting team meetings, you can upgrade to a paid plan. Or you can integrate Slack with free video conference software like Zoom, which is what we ourselves use for larger video conference meetings. Slack provides customer support in tiers. The free plan offers users email and an online help center. The Standard plan provides priority support, and the Plus plan has 24/7 support with a four-hour response time. As an online collaboration tool, Slack is great. If you’re looking for a full-blown project management tool, you might consider Zoho Projects, Monday or free project management software instead. Many of those integrate with Slack and include features like project-costing and Gantt charts, which aren’t available on Slack. In addition, there is no phone support for Slack. If online reviews are any indication, users love Slack. In fact, we at Fit Small Business predict it will come to replace much of our internal email communication. Here’s how small business users rate Slack in our Slack Online Review. Trello is a project and task management tool for small businesses that want transparency into what’s being done throughout the organization. It’s free, and can be used in organizations as diverse as wedding planners and home builders, or even as an individual’s task list. 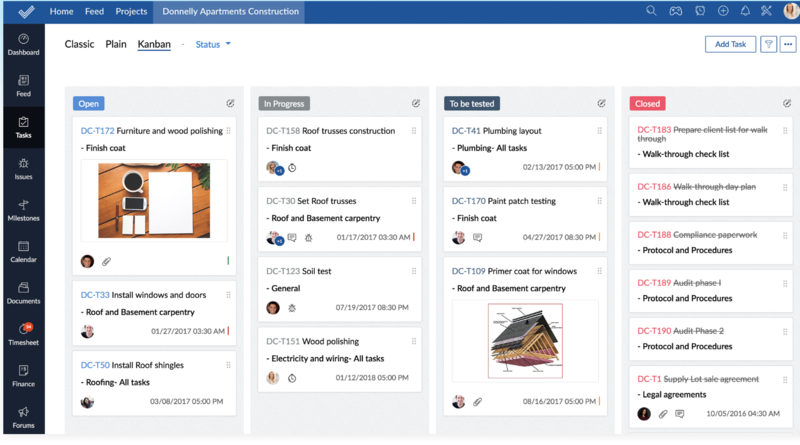 What makes it great is that managers see the status of work at a glance using Kanban-style boards for task and project tracking. Workers and their supervisors can view every detail, from checklist tasks to attachments. And unless you need security controls and centralized management of projects, your team can use it at no cost. Trello provides an intuitive tool for teams working on shared projects. Trello is free for unlimited members and the user interface is intuitive enough that even non-techies will be up and running in no time. They’ll have their own boards, lists, cards, checklists and attachments. The free plan even allows one free Power Up—that’s a fancy way of saying one third-party app integration like Slack or Google Drive. Or, it can be a custom field, such as if you want to add a link to an existing free project management tool like Insightly. Trello provides a robust collaboration tool for free. However, if you want to attach larger files, have more than one integration, get priority support and have help getting started, you’ll want to upgrade. Pricing ranges from $9.99/month to $20.83/user per month when paid annually. Notice that even in the basic plan, you get all the online collaboration features. The only difference in the paid plans are that you can attach bigger files and have better organization tools with additional security and priority support. Trello uses a drag-and-drop, card-based organizational structure that’s as intuitive as a game of solitaire. 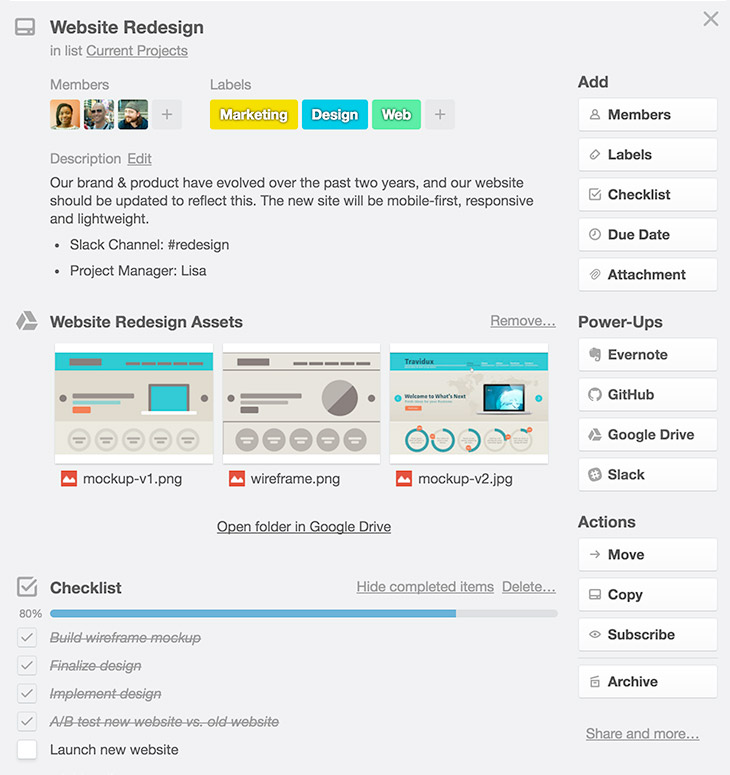 Users sort like-projects into stacks based on their organizational needs. For example, a software company might have project cards sorted into stacks labeled concept, beta, pre-release and upgrades, whereas a media company might track prospects, proposals and agreements. Each Trello card holds lots of data. Most companies would find stacks labeled “to be done,” “in progress,” “final approval” and “completed” to be helpful. And teams can have their own Trello boards based on projects, functions, or any type of workplace initiative. In fact, don’t be surprised if your employees adopt Trello for home use. It’s great as a personal to-do list as well. Cards are the foundation of how Trello works. Each Trello card contains all the information you need to keep your team on the same page. Your team members can add comments, use a checklist, attach files and images, and label each card. Opening a card provides a deeper dive on what’s in each Trello list. With Trello, you can create detailed checklists within each of your cards. A product card could have stages for quality checks and labeling. A wedding planner could create a card with a checklist for each upcoming event. Or HR staffers could keep track of cards for each new hire, and then share those cards with individuals, like IT and security, who need to prepare in advance for a new hire’s first day. The possibilities are endless—many people use it and post their uses on Pinterest. Checklists can be created and/or customized for each card. 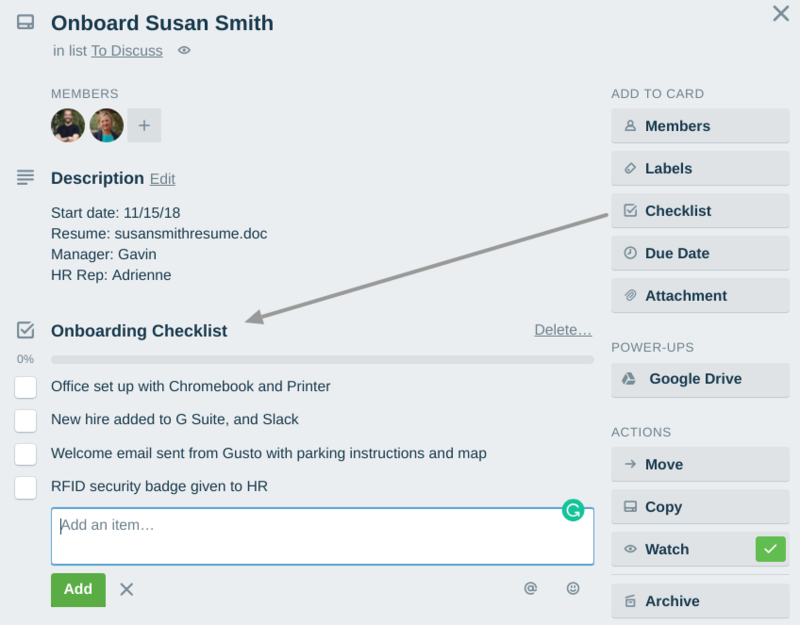 Unlike individual tasks in G Suite, these cards are shared and transparent to all within your organization who have access to the Trello board. Labels are yet another way to visually organize the work your business does. You could label by team, by stages, workflow, product, or shift. Your options are wide open. And you can color code the labels. That lets you quickly find what you’re looking for by viewing cards with just that color or label. Small businesses owners may find this at-a-glance view helpful to identify which customers or projects need follow-up immediately, and which can wait. Trello doesn’t call their browser extensions, apps and add-ons “integrations.” Instead, they call them Power-Ups. They include analytics and reporting tools, file management, social media and numerous other apps. Examples include two-way sync with Asana and Evernote, and links to software like Freshdesk, Mailchimp and Zoho CRM. Trello provides customer service from 9 a.m. to 5 p.m. EST through their support team. Another cool way to get help on Trello is to ask the Trello Community. Both options are available on their website. Unlike G Suite and Slack, there’s no way to instant message someone on Trello. However, you can @mention them in a comment, and they’ll get an email (if you’ve set it up to do so). And unlike Monday and Zoho Projects, Trello doesn’t have the types of project management reports you might expect, like Gantt charts and project costing. It’s more of a scaled-down project tracking tool to keep all team members on the same page. Users like the fresh interface and the transparency as well as being able to see details like timestamps and user notes with Trello. We also use and love Trello! Overall, third-party review sites, including ours, give Trello high marks. Being free, Trello is a great team collaboration tool with both online and mobile apps that let you keep tabs on work progress and allow workers to keep each other in the loop. Since it’s free, what are you waiting for? As part of the Zoho suite of online tools, Zoho Projects provides a fairly low cost way for teams to collaborate on, well, projects. In fact, they have a free plan. 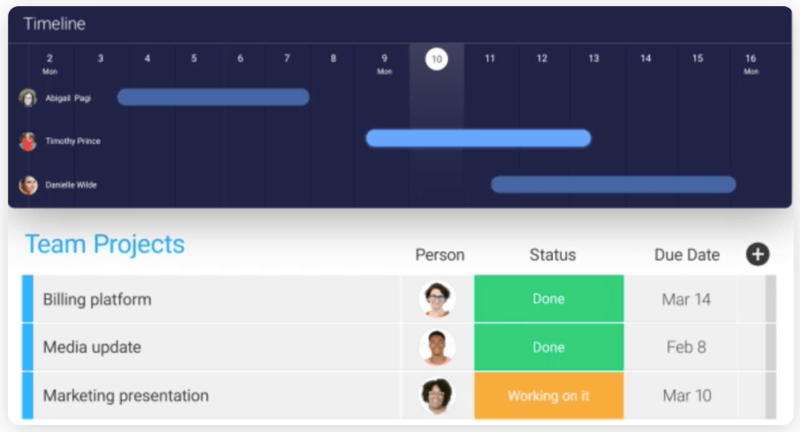 Unlike the prior tools we reviewed, Zoho Projects lets you track time worked on those projects by various team members. You can then bill that time to clients. That makes Zoho Projects great for businesses that collaborate to manage client projects and large-scale initiatives like building construction where time is billable. Zoho has a forever free plan that gives your business access for five users and two projects. It also lets you attach files and integrate with Google apps. Otherwise, Zoho Projects’ pricing ranges from $20 to $85/month, depending on how many projects and users you have. That makes it a very affordable online collaboration tool for even the smallest of small businesses. 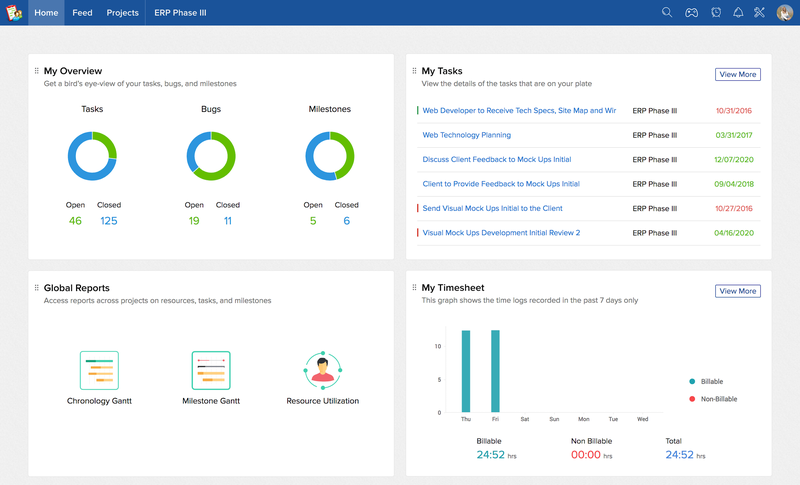 Zoho Projects also offers an Enterprise package that’s similar to the Premium package, with more advanced project management features such as additional templates, more customization, resource utilization, task dependencies across projects, critical path and a service level agreement (SLA) for issues. For team collaboration, the features of the free plan may suffice. That includes a tool to manage your work by setting it up as a project or two, for up to five employees. However, if you’re looking for time tracking, software integrations or the ability to track time against jobs for billing purposes, then the Express package will have the robust features you need at an affordable price. In fact, while it looks similar to Trello, Zoho Projects has additional reporting tools for keeping track of your team’s efforts as they collaborate together online. Zoho Projects offers multiple views. Your team can use forums dialog about their work and projects. You can also send messages directly to the forum from an email, which is a huge time saver. However, Zoho Projects doesn’t have email within the software like G Suite, but it does integrate with other email platforms such as Gmail and Outlook. Zoho Forums and Dashboard help keep employees aligned. In addition, you can purchase a Zoho Mail hosted email account for your business for an additional $3/user per month to $6/user per month if you don’t already have an email domain for your business. Zoho Mail has full integration with their other Zoho products, such as Zoho Docs, Connect and Office Suite. The Zoho Projects dashboard gives you a total view of projects, documents and other resources at a glance on a tabbed screen. In fact, this level of navigation and multiple views make Zoho Projects great for businesses that want to keep tabs (literally) on the work being done and conversations being had by their teams. Unlike Trello, Zoho Projects doesn’t hold you hostage to one view of your tasks and activities. You can choose to view them in a classic project format, a plain view, a view that shows dependencies and a Kanban view, as examples. That lets you work the way you want. The dependency view is another great way to see where there may be bottlenecks in your workflow (for example, perhaps parts are slow to arrive, or the testing team is running behind schedule). Not only can you track time spent by employees for billing purposes, but employees can submit their hours to you for approval. 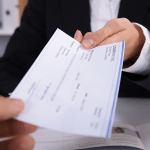 They can then be flagged as billable or non-billable hours. You can review time by employee in a list, in a grid, on a calendar or in a report. It’s easy to export time worked in a .csv or .xls file format in order to upload it into your payroll or accounting system. Zoho provides help online through their help center, in-depth user guides, knowledge base, video and community. In addition, you can email them directly from the website and get a response 24/5. There’s no live support on the weekend. Zoho Projects lacks the email account feature of G Suite (unless you want to purchase their Zoho Mail product). Otherwise, even their free version is a nice option for smaller companies with team members who need to collaborate on work projects. Zoho Projects is just one tool in a huge suite of Zoho business solutions that includes CRM software, HR software and finance software, to name a few. Here’s what small business users say in general on our Zoho Product Review. For those businesses that need team members to collaborate on projects billed to clients, Zoho Projects is an affordable option. It provides advanced project management features to keep all team members on the same page. Engagedly is an online collaboration tool focused on workplace performance. It’s best for organizations that want to provide transparency into goal setting and feedback. It’s a bit more expensive than G Suite or Slack, and like Zoho Projects, can be added to them. It offers plenty of options for peer input, such as groups and surveys. You can set and cascade goals, track one-on-one meeting notes, and provide feedback using tools like informal performance reviews and 360-degree feedback. Although Engagedly is marketed as a performance management tool, its collaboration features make it worth including in our roundup of online collaboration software. Isn’t that why we collaborate—to get things done? It may be best for businesses that need the team to collaborate on organizational-level goals cascaded to each team and individual. Engagedly doesn’t provide its pricing online. Third-party review sites indicate that it costs somewhere between $3/user and $7/user per month, and that they have a monthly minimum between $100 and $200/month. You have to contact them directly for a quote. The features that make Engagedly useful for an online collaboration tool are its ability for all employees and teams to contribute to your organizational goals. It provides one-on-one feedback meetings with managers, social collaboration with peers, employee surveys, team rewards and recognition, and yes, performance assessments with peer input. Therefore, employees collaboration on everything—even performance reviews. 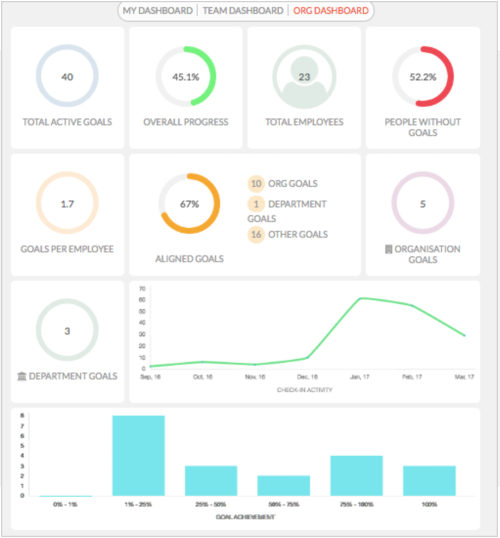 Engagedly provides dashboards so workers can see how the company is doing overall, and how they contribute. Groups allow select individuals to interact. They can be created as a closed group, which is secret, such as when the executive team is working on budgets. Or, you can have open groups similar to channels in Slack. Anyone can create a group, so it’s a great place for peers working on a common project, goal or initiative to interact, post updates, ask for help, and share ideas. Like Slack and Trello, you can upload documents for team members to view and comment on within those groups. With Engagedly, you can set goals and share them with others as contributors. You can then determine how you want to receive updates, which Engagedly refers to as check-ins. For instance, you can check in using numbers, such as five cars sold, or 20 calls made. Or you can check in using a percentage of goal accomplishments, such as a fence being 50 percent complete. You can also break goals down, similar to tasks in G Suite or a checklist in Trello, and provide key results and weighting, so that you can measure what percentage is done and how much that item contributes to the overall goal. For instance, the fence above might contribute 20 percent to an overall landscape project. 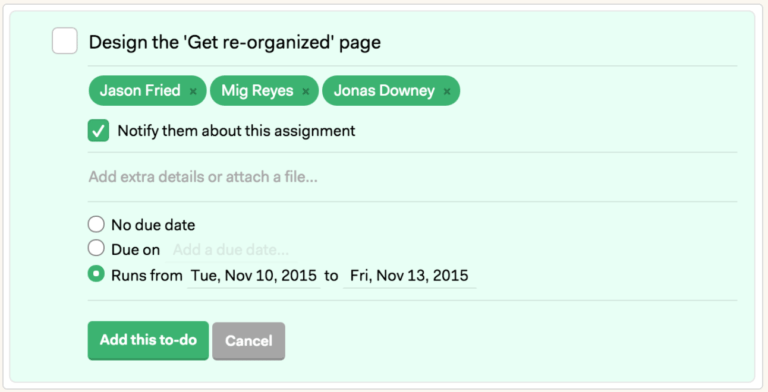 Like Trello and Slack, you can also add attachments and reminders. To improve team collaboration, Engagedly adds gamification to its software. Employees can earn points and badges from their peers for sharing knowledge or completing tasks, as examples. Further, if your organization chooses to do so, you can assign gift card rewards based on rules, points and any dollar amounts you choose. That’s a great way to motivate collaboration. To improve teamwork, as well as individual and team performance, Engagedly builds feedback in at every step—in ways like one-on-one meetings with managers, employee self-reviews, and 360-degree feedback. Teamwork and online collaboration improve when employees get frequent, specific feedback on their contributions. Unlike most other software providers, Engagedly publishes their customer service phone number right on their website. They’re available 24/5. They also have great documentation, including webinars, service agreements and step-by-step setup instructions (with screenshots) on their site. Engagedly doesn’t have email or a shared document library like G Suite. In addition, it’s the only tool that we couldn’t get pricing for. You have to contact them directly for a quote, which often means you’ll need to suffer through a sales pitch. Further, they’re missing more standard project tracking tools like the project timelines and Gantt charts offered by Zoho Projects and Basecamp. And since they’re not designed for external clients, there are no client options like with Monday. Engagedly has many online reviews from users who rate the features highly. Some feel that it’s difficult to find information like documents and ideas with so many praise posts. Most everyone raves about the ease of implementation and great support. We’re working on our own review of Engagedly soon. If you’re looking for a tool that can improve online collaboration around company and team goals, Engagedly provides a unique option. Social sharing, praise and gamification make collaboration fun. Your business is the one likely to benefit. Basecamp is an affordable online collaboration tool that costs only $99 month, all in. It’s been around since 2004 and has added great features over that time frame, including document sharing and project management in a visually engaging tool. It’s best for any distributed team or employees who work together on shared initiatives, and brings together the best features of G-Suite and Zoho Projects—like document storage, scheduling and project tracking. 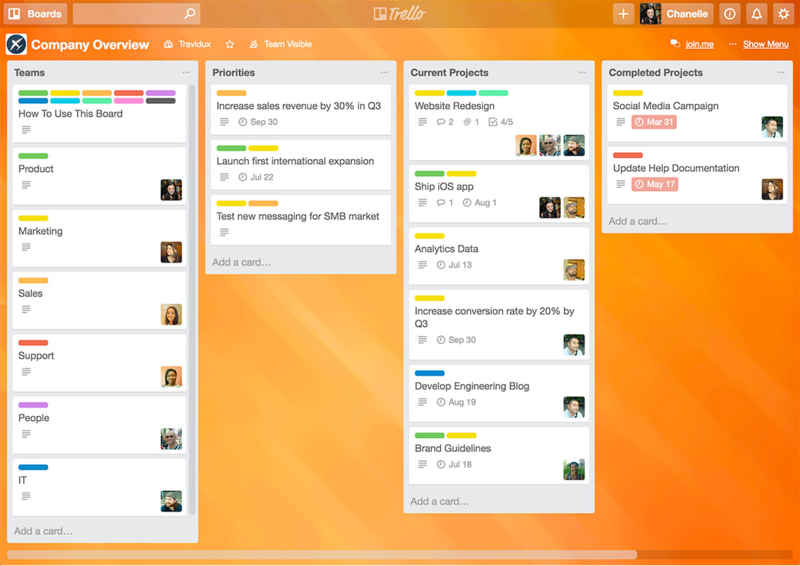 Plus, it just feels intuitive and not as formal as more traditional project management tools. While it’s great for project management, what makes Basecamp stand out is that it’s also very easy to use and supports robust team communication. Even non-project folks can quickly jump in and contribute ideas, feedback and documents. Basecamp offers a flat rate of $99/month for unlimited users and all features. Unlike the other tools we’ve reviewed, you’re not charged a monthly rate per user that will keep going up, up, up as your business grows. You can start with Basecamp now when you have just a few employees, and it will keep serving your business as you scale. Basecamp also offers a free 30-day trial that you can sign up for with nothing more than your email address or Google account. 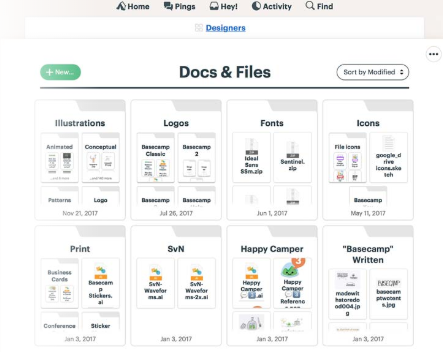 Basecamp offers team communications, a dashboard, collaboration tools (that can serve the same purpose as email), calendar scheduling and document storage. It also has integrations with Google apps and Outlook, and provides feedback and praise tools similar to Engagedly. It’s got project features like Zoho People and Monday, and yet it’s designed in a more user-friendly way. Basecamp’s interface is intuitive, even for non-project folks. 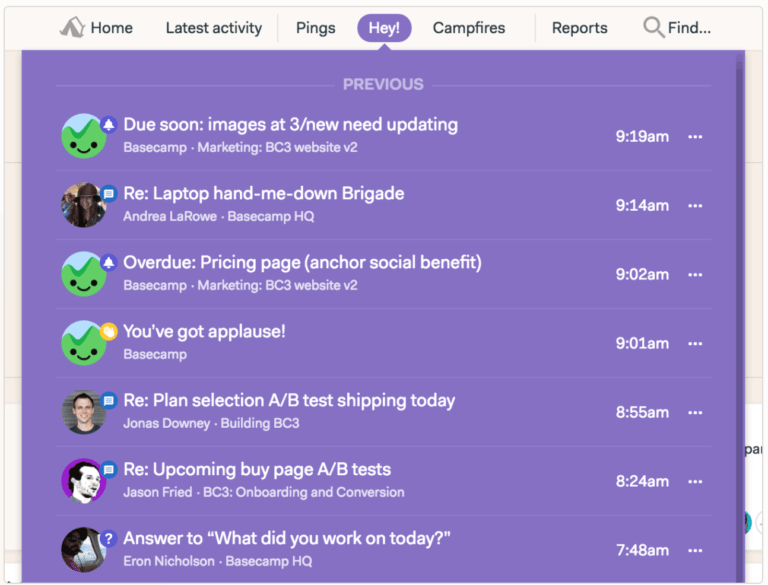 Basecamp uses a tool called campfire communication, which operates similar to Slack. You can customize message boards, add images and files and applaud the comments you like—similar to Slack. It also has a cool feature called Work Can Wait, which turns off notifications when you’re not on the job. You can even snooze notifications for up to three hours if you’re working on something critical and don’t want to be disturbed. Using the Hey tab, each user can consolidate their information and updates on a dashboard. They can quickly see their most recent activities, projects they’ve been pinged on, communications (Campfires) and reports. Basecamp offers to-do lists, scheduling, and document management, not unlike G Suite. Whereas Trello is great for small project teams to collaborate on tasks, the project management features of Basecamp are more like those offered in Zoho Projects and Monday. Of course, being more robust, it takes a bit more time to set projects up in Basecamp than when using a tool like Trello or goal setting software like Engagedly. Unlike Slack, Trello and G Suite that offer tons of apps and integrations, Basecamp doesn’t offer as many. However, their Zapier and automate.io APIs lets you add pretty much any tools you want: QuickBooks, Salesforce, Mailchimp, Dropbox, and G Suite, to name a few. Users can send a request via Twitter as well as by submitting a support ticket from the Basecamp website. They also provide a learning center with helpful guides. Their website boasts a nine-minute response time! Support hours are 8 a.m. to 6:30 p.m. CST, Monday through Friday. Basecamp doesn’t have an integrated email feature like G Suite does, but neither do most of the other online collaboration tools we’ve checked out. It also doesn’t have as many native integrations, but does provide API tools so you can customize it as you like, with just a bit more effort. Overall feedback is great for Basecamp, which earned five out of five stars on our Basecamp Review. Users like the simplicity and features. No wonder it has nearly three million users. However, some wish the calendar integration was better. Basecamp is an online collaboration tool that adds value with document management and robust team communication tools. Work is organized into projects and since the price is fixed at a flat rate, there are no surprises as you add staff. Monday is the new name of an online collaboration and communication application formerly known as dapulse. It’s priced similarly to Zoho Projects and Basecamp. It’s best for project-focused businesses that need to customize project management workflows. It’s notable as a project management tool that allows clients to engage in the process and provide feedback. It provides sharable boards that let you work with outside users—from clients to freelancers and sub-contractors. In addition, it’s infinitely configurable and works for any industry, from auto repair shops to media firms. External clients can be added to view progress. Guests can only see the boards they’re invited to, such as a website project you’re building for a client or a home you’re constructing for a customer. And, like many of the online collaboration tools featured, Monday integrates with Trello, Slack, Gmail and more. Monday prices their product in tiers, based on the number of users you have. For example, with five users, the Basic package costs $25/month, whereas the Pro plan costs nearly $600/month if you have 50 users and pay annually. Therefore, the table below shows pricing for a business with 10 users so you can see what each tier provides. The more employees, the higher the cost. Monday also has an enterprise tier that includes 24/7 priority support, single sign on (SSO), and one-on-one training, as examples. Monday uses a drag-and-drop interface with a high level of customization. It can manage tasks, assignments, time frames, dates, durations, and provides a customizable Gantt chart. From a communication and collaboration point of view, you can create alerts and notifications. Users can also search for any content they’re looking for, including training and information videos attached to projects. Pulses are what Monday calls tasks and projects. They can be anything. They can be a product, a day of the week, or a client. Any way you want to organize your team’s work is possible, and you can then add columns to track details relevant to each one. Ownership can then be assigned to the project (pulse) or sub-task (column). Therefore, it’s a much more intuitive way for employees to be notified than traditional project management software offers. In fact, Monday works more like how a manager might communicate and delegate tasks in a meeting—by starting with a work task and assigning different parts to different workers. Messages are tied to projects, and you can attach files, GIFs and @mentions within your messages. You can see once messages are read and follow up as needed. You can even create a checklist on the fly within a message, which lets a team member check off to-do items without leaving the message. In addition, social media features like “thumbs up” keep messages fun. Using insights from customers in multiple industries, Monday has an outstanding array of pre-built templates that support businesses of all types—from custom design firms to manufacturers. While similar to the project templates in Zoho Projects, Monday’s templates are easy to edit using drag and drop. That lets you start up quickly by choosing a template from a similar industry and modifying it for your business. Similar to Trello, Monday provides infinite options for customization, tasks, and assignments, including colors and metrics. That makes it useful to businesses with highly complex or customized processes, which often happens when you’re working with a client and they want you to follow their workflow process and approvals. Monday provides 24/7 support by phone, email and messages sent directly from their website. If you upgrade to the Enterprise plan, you’ll get VIP support, one-on-one training and a 99.9 percent uptime SLA. Monday is feature-rich and the interface is slick. But it’s not necessarily easy to set up. Like other highly-configurable tools, it can feel overwhelming. You may want an administrator to set it up and provide documentation and standards before you roll it out. Then you’ll likely need to spend time training your team members on how best to use it. In comparison, the other online collaboration tools we reviewed are intuitive enough that training isn’t really required. Reviews are mixed on Monday, with the most positive reviews coming from people who have figured it out and are using it to manage large complex projects. Smaller businesses find the entry level pricing great, similar to Zoho Projects. Third-party websites give it a solid four out of four stars. If your business requires client or external input on projects and tasks, and you don’t want to track down random emails for feedback, Monday is the best online collaboration option. You can invite an external person and limit their security to just the pulse (work effort) they need to join in on. Figma Agencies that need to collaborate when designing websites or user interface projects. Venngage Technical design firms that collaborate on process flows, charts and complex data illustrations. Insightly Customer contact management firms that want collaboration and tracking using a CRM. Zoom Businesses that host client demos, applications and team updates using video conferencing and recordings. Podio Any business that wants collaborative brainstorming with idea management and tracking across teams. Freshsales B2B sales firms that want features like call recording as they work together to support clients. Online collaboration tools make it easier for virtual work teams to get their jobs done. Collaboration software replaces traditional meetings and document sharing with cloud-based tools like chat, shared documents and task lists. 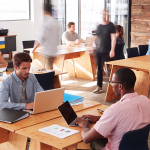 Workers can access feedback, documents, timelines, deliverables and each other—in a shared workspace environment. That ensures everyone is on the same page, even if they’re not in the same location or time zone. If you’re looking for an online collaboration project tool that can integrate with other low-cost or free collaboration tools like G Suite, Trello and Slack, consider using Monday. It can maximize your team productivity and be configured to support your internal team and clients’ needs for ongoing collaboration.